It’s sunny and the winds are finally down the day after our first major frost here in Eastern Iowa – a perfect day to visit the prairie. So much has changed over the last few weeks. 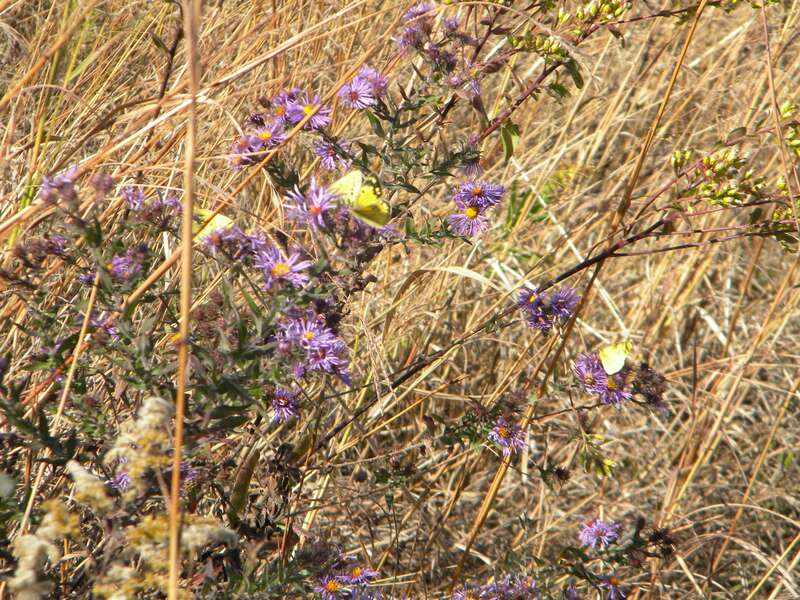 The eastern half of our prairie still has some purple aster and yellow goldenrod flowers scattered about while the western half has no flowers left of any kind. Most of the butterflies that were so numerous just a few weeks ago are gone now. Those that remain are clustered around the areas where there are still some flower blossoms. In a protected corner, a nice stand of Maximillan sunflowers still hold their own — with numerous sunny yellow flowers climbing the tall thick stems. It’s the only stand left, with just a few scattered stragglers elsewhere to remind us of the flowers that dominated most of the prairie for nearly a month. 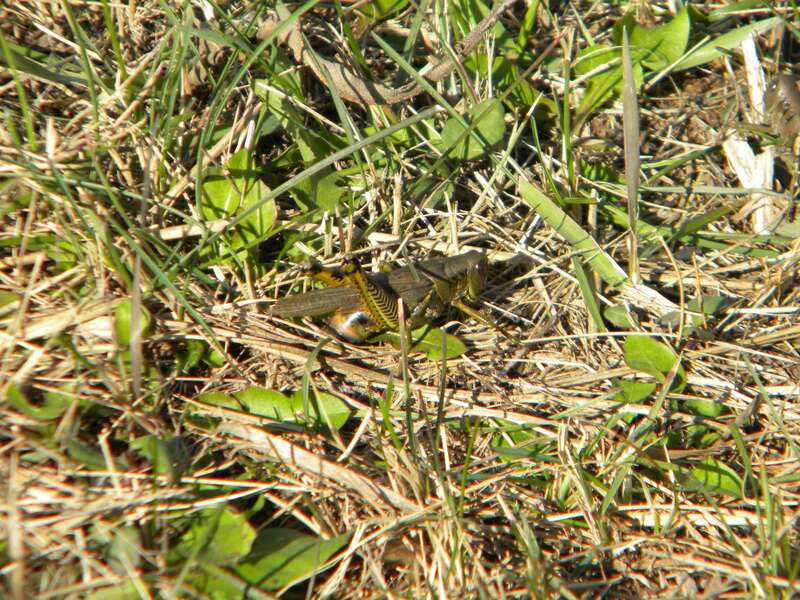 Grasshoppers are prevalent on the mowed paths where they graze on the grass. 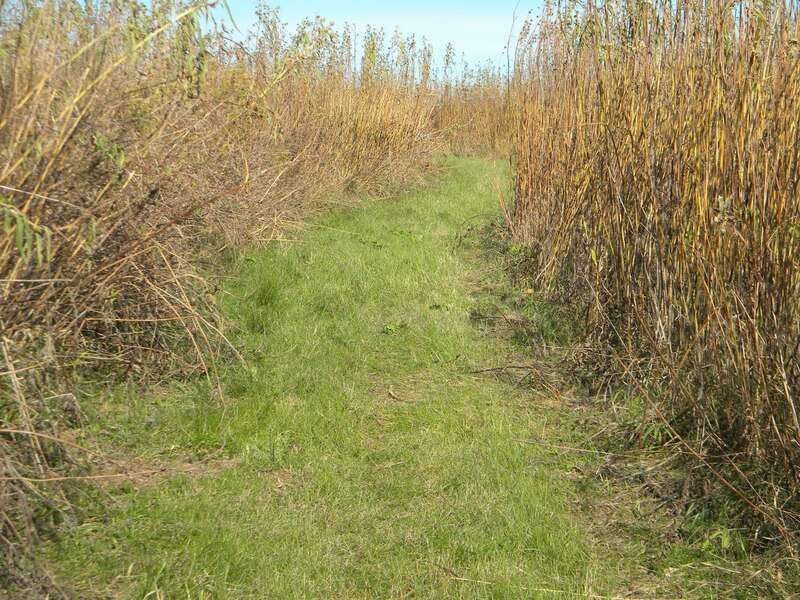 Prairie paths are mowed monthly to make it easy to see all parts of the prairie without having to hike through thick, tangled vegetation. Even though most of the prairie flowers are gone, replaced by the seeds that will drop to the ground or drift to new areas in hopes of finding a suitable place to put down roots, the walk is as enjoyable as ever. 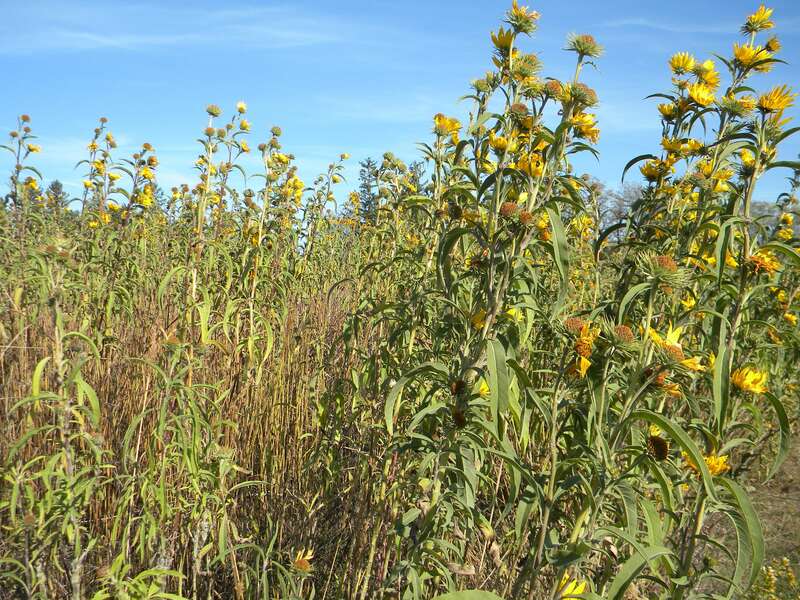 No open soil is available on our soon-to-be 20-year-old prairie, so most of the seeds that don’t manage to migrate elsewhere will feed migrating and over-wintering birds, mice, shrews, quail and pheasants. 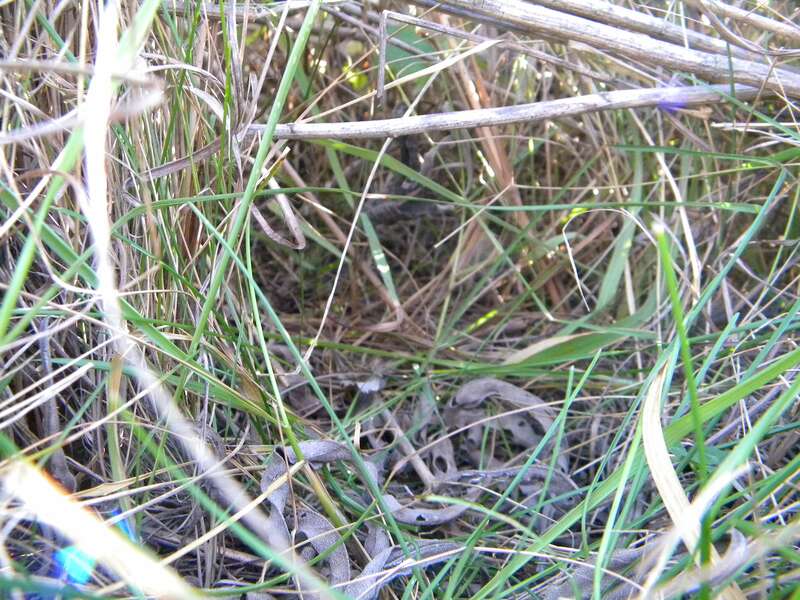 The prairie floor seems to be a solid mass of vegetation, but a closer look shows small tunnels everywhere through the grasses – places for creatures to nest, run and hide. And as I walk, I hear little rustlings here and there. I notice something unusual in a section dense with goldenrods — numerous swellings on the stems of many of the goldenrods. 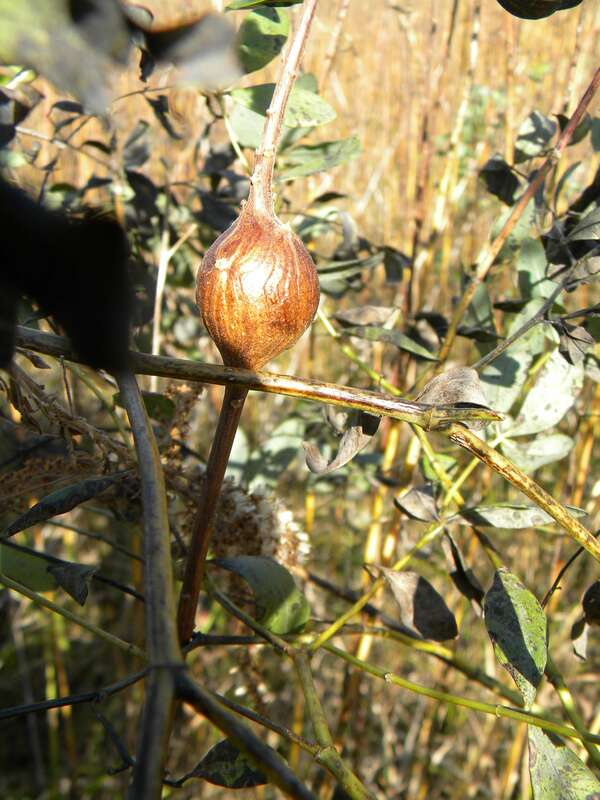 The swellings are called galls, and are made by a parasitic insect called a goldenrod gall fly. 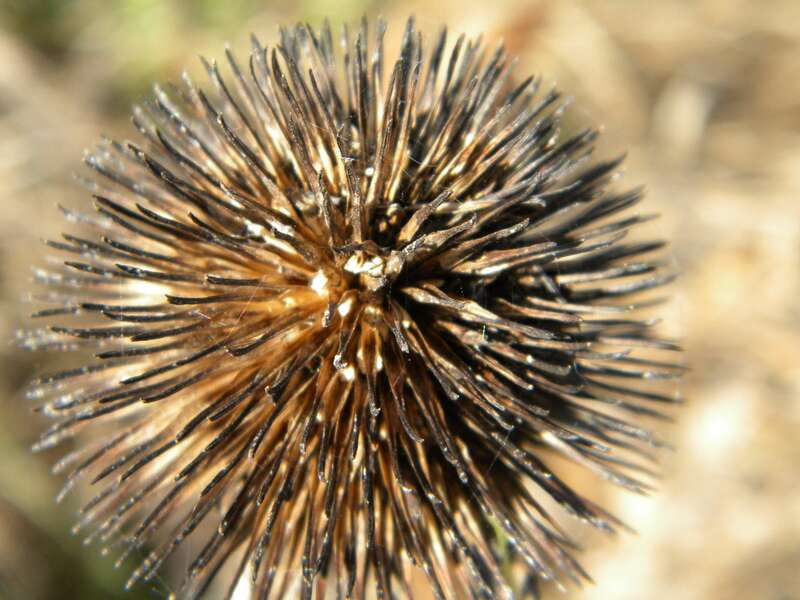 The female lays her eggs inside the stem. 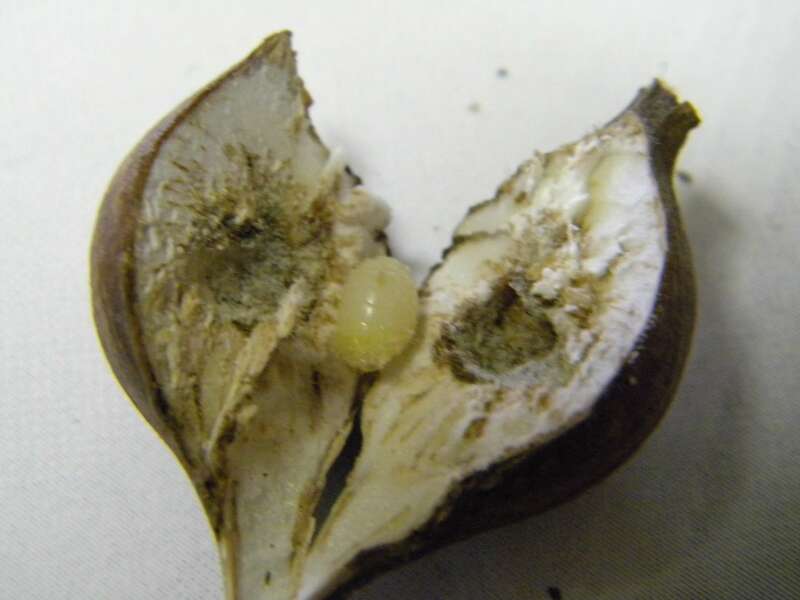 The larva, when it hatches, eats stem tissue, causing the stem to grow abnormally and produce a gall. 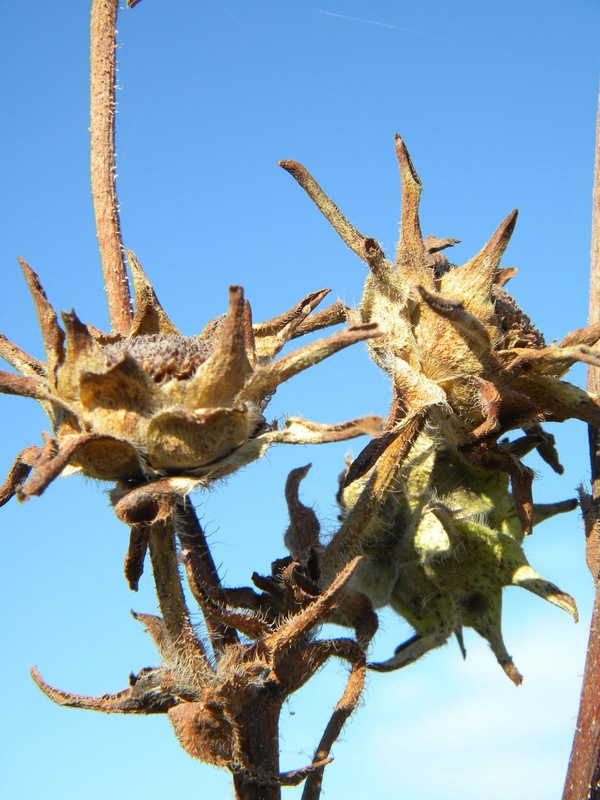 The larva stays inside the gall, eating and growing until winter when it creates an anti-freeze like substance that keeps it alive during the winter. In the spring, it will exit the stem as an adult fly. 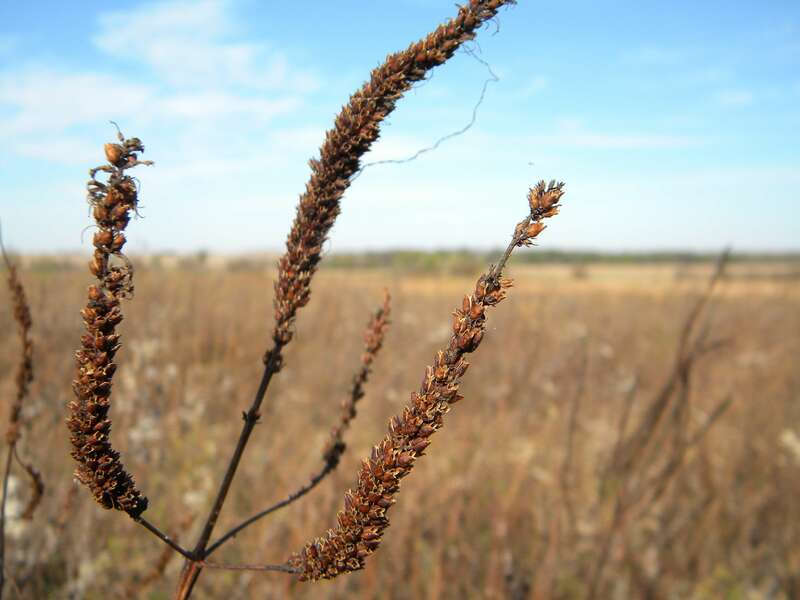 While the prairie is ending its abundance of colorful blooms, the many interesting textures and shapes of the foliage and seed heads keep the prairie beautiful and interesting. 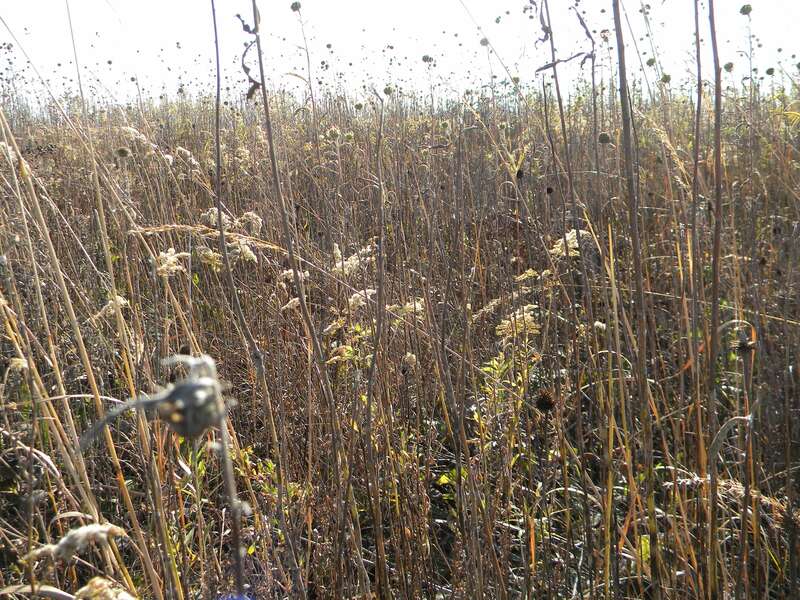 And animal life goes on — the prairie will provide food and shelter even through our long, cold Iowa winters. We’ll check back to see how that wildlife is faring as the days turn cold and snowy. 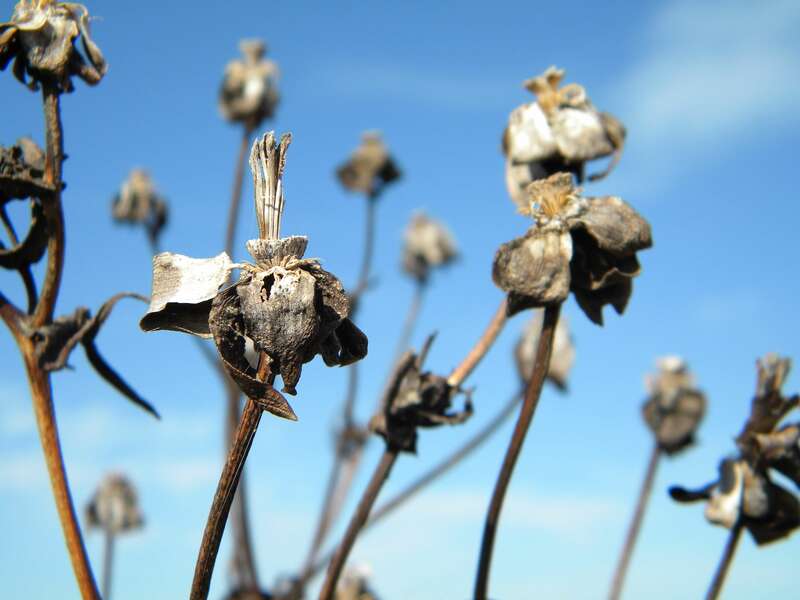 This entry was posted in At the source, Sustainability and tagged blog, flowers, Frontier, Kathy Larson, seeds, tallgrass prairie by Cayenne Room. Bookmark the permalink. 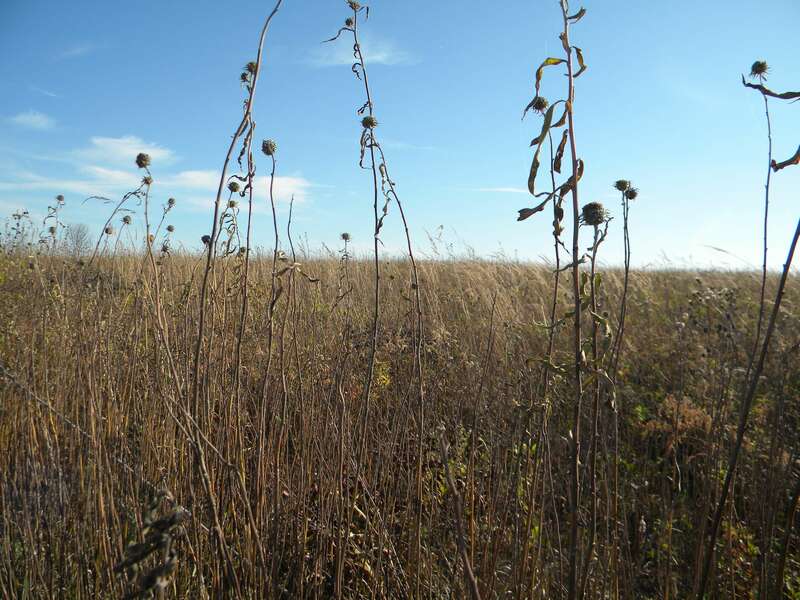 Restored prairie–just one of the many reasons to love Iowa!